Chocolate mousse garnished with mint leaves, a raspberry and edible flowers. Photo © Magdanatka| Dreamstime. CAPSULE REPORT: Julia Child’s chocolate mousse recipe, developed during her stay in France and annotated by THE NIBBLE. This is Page 2 of a three-page article. Click on the black links below to visit other pages. Page 1: What Is Mousse? 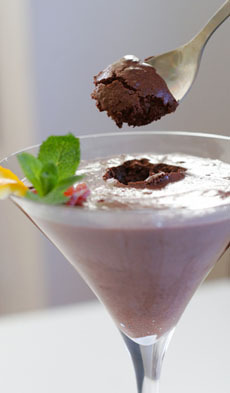 The first chocolate mousse recipe we ever made was Julia Child’s, from Mastering The Art Of French Cooking. Though we’ve tried many others over the years, from milk chocolate to Bailey’s Irish Cream, we return to the basics from time to time. We did so recently, and felt we should share the recipe—with our variations—to NIBBLE readers. Julia’s recipe substitutes beaten egg whites for cream—a bit more protein, a bit less fat (but that wasn’t the intention—no one discussed “protein” and “fat” in 1961!). 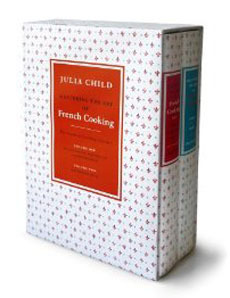 Mastering The Art Of French Cooking: Our original set, decades old and still available. 1/4 cup orange liqueur—Cointreau, GranGala, Grand Marnier, Triple Sec, etc. *NOTE: When Julia Child published her cookbook in 1961, “baking chocolate” was a generic product. You can improve on her recipe by using a finer quality of chocolate. Look for Callebaut, Guittard, Valrhona and other fine brands, with a cacao content of 60% to 70% (we use 70%). BEAT the egg yolks and sugar together until mixture is thick, pale yellow, and falls back upon itself forming a slowly dissolving ribbon. Beat in the orange liqueur. BEAT over cold water for 3 to 4 minutes until the mixture is cool and again forms the ribbon. It will have the consistency of mayonnaise. MELT the chocolate with the coffee over hot water [or microwave]. Remove from the heat and beat in the butter a bit at a time, to make a smooth cream. BEAT the chocolate into the egg yolks and sugar, then beat in the optional orange peel. BEAT the egg whites and salt until soft peaks form; sprinkle on the sugar and beat until stiff peaks are formed. STIR 1/4 of the egg whites into the chocolate mixture. Fold in the rest. Mix it in gently to prevent the air from deflating. TURN into a serving dish, dessert cups or petit pots (we like martini glasses; more ideas on next page). Refrigerate for at least two hours or overnight. Lifestyle Direct, Inc. All rights reserved. Any images are the copyright of their respective owners.